CBSE Class 10 Maths Board Exam is considered to be the toughest among the students. The reason behind this is the vastness of the course curriculum and the complexity of the topics. Students often feel intimidated by this subject and thus, put in a lot of efforts and hard work for Maths board exam preparation. This is where they need CBSE Class 10 Maths Question Papers. CBSE Class 10 Maths Question Papers provide students a list of all important and recurrent topics of the curriculum. Due to the vastness of the course curriculum, many students are unable to prepare the entire course on time. Practicing from Question Papers for CBSE Class 10 Maths can help them mark the important topics or recurrent questions and practice only those. This will not only save their time but also help them prepare strategically. Moreover, many a times students find it difficult to complete the entire paper on time. They have an issue with the time management because there always are certain questions which are quite difficult and lengthy. Thus, these CBSE Class 10 Maths Question Question Papers will not only provide students with real time exam experience and feel, but also help them increase their speed and produce accurate answers for the exams. 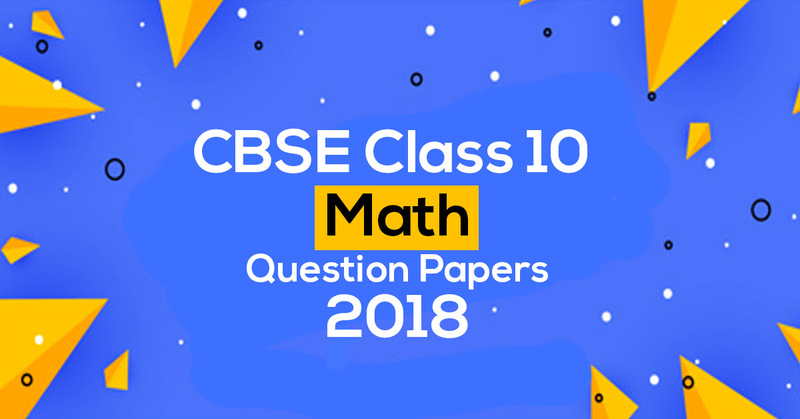 These CBSE Class 10 Maths Question Papers are provided to the students in easy downloadable PDF format to ease out their learning, preparation and revision process and help them score maximum marks in the board exams.